Summer can be a hard time to care for your feet. With Christmas just around the corner, we all have a lot on our plates, and tending to our poor feet is not likely to be at the top of your priority list. But sore feet, incorrectly cut nails, or dry cracked skin can ruin your summer holiday and we’re here to help! Get rid of that hard skin! When dead, hard skin (or callus) accumulates around your heels, or the ball of your feet, it increases the amount of pressure on the soft tissue underlying these areas. This can cause discomfort when you’re on your feet, and over time it may cause the skin to split, leaving painful cracks and fissures - especially common around the heels. Smoothing rough, callused skin can be done at home by using a pumice stone or foot file before your shower. If you have a large amount of hard skin or if you have cracks or fissures present, then it would be safest to see your podiatrist in order to have this removed using sterile equipment. This is a pain-free experience, and you will leave with your feet feeling a lot lighter! It’s all about staying hydrated! Once you have reduced the hard skin on your feet, they will be able to soak up moisture a lot more easily. Keeping your skin hydrated is important to help prevent the recurrence of dryness, cracking and flaky skin, The type of moisturizer which you use on your feet is important too. Because the skin on your feet is thicker, oil or lipid based moisturizer will soak in more readily. Additional ingredients which are often included in specialised heel or foot balms can be things like urea, salicylic acid or lactic acid, which all help to soften dead skin and aid in its removal. Try to get into a daily habit of applying moisuriser straight after a shower for maximum absorption! Be kind to your nails! Breaking out the summer sandals will have many women reaching for their favourite nail polish, and a little care will help to ensure you don’t end up with discoloured nails that you feel embarrassed about. The first thing to consider is what type of nail polish you use - or if you need to use any at all! A visit to your podiatrist should see your nails cut and buffed so they are healthy and pink (and looking good enough to skip the polish in our opinion!) However, if you wish to paint your nails then consider going for polishes that are “5-free”, and look for brands such as Butter London, Zoya or Priti NYC, which have eliminated formaldehyde, dibutyl phthalate, and toluene, from their formulas, as well as known allergens camphor and formaldehyde resin. Finally, remember to give your nails a break. Just like skin, your nails need to breathe, and keeping them covered by the airtight barrier of nail polish for weeks or months at a time isn’t good for them! It can even increase the likelihood of developing fungal infections. If you must wear nail polish, then remove it after 1-2 weeks and leave your nails polish free for another few weeks to allow them time to recover. In the season of celebrations, us ladies might find ourselves in high heels a little more often than we would like. In order to minimise a high-heel hangover, choose your shoes carefully. Try to opt for those with a smaller, thicker heel whenever possible, and choosing shoes which are attached to your feet (as opposed to slides) will help to minimise muscle strain. Adjustable straps, both around the ankles and over the toes will also help to keep feet comfortable if they swell, which is very common in the warmer months. Cushioning is paramount to comfort, choosing shoes which are well cushioned under the ball of the foot will reduce pressure through this easily injured area. Finally, giving your feet a rest after wearing heels - massaging them or stretching them by rolling them on a ball or frozen bottle can help to reduce muscle tightness and fatigue and make all the difference. 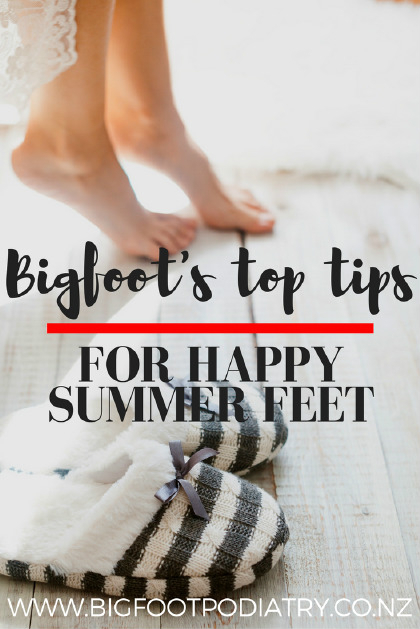 If you think you need help or advice about how to get your feet summer ready, then book in for an appointment today - we're happy to help! ?hanks ffor sharing yo?r ideas. I'd als? lik? to convey t? ?t video games hawve ?e?n a?tually evolving. games ?ay too ha?e had to progress through m?ny decades.